GOP "tea-baggers" take note: The Justice Department is closing in on offshore tax cheats. And former Sen. Phil Gramm, their chief enabler, could be caught in the net. 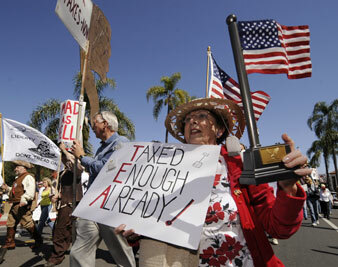 Anita Dwyer participates in a rally and march in protest of higher taxes in Santa Barbara, California, April 4, 2009. One wonders if Phil Gramm has been made just a tad nervous by the news on Tuesday that one of UBS’s super-wealthy private clients has pleaded guilty to tax evasion. That’s the second case in two weeks involving the bank at which the former senator is a vice chairman, and 100 other clients are under investigation for possible bank-assisted tax fraud. Gramm, the Republican former chair of the Senate Finance Committee, where he authored much of the deregulatory legislation at the heart of the current banking meltdown, has for the six years since he left office helped lead a foreign-owned bank specializing in tax dodges for the wealthy. These schemes by the Swiss-based UBS not only force the rest of us taxpayers to pay more to make up the government revenue shortfall but are blatantly illegal. In February, UBS admitted to having committed fraud and conspiracy and agreed to pay a fine of $780 million. Republican “Tea Baggers” take note: Offshore tax havens do not equal populist revolt. But then again, if you are Phil Gramm or his wife, Wendy, you might expect to get away with a great deal in the way of financial machinations. After all, neither has ever been held legally responsible for the Enron debacle, in which the Gramms played a major part. As a top government regulator, Wendy Gramm changed the rules to make Enron’s chicanery possible, and as the chairman of the Senate Finance Committee, Phil codified those rule changes into federal law. While Enron execs like Chairman Ken Lay (a major Gramm campaign contributor) were indicted, the charmed couple that created the loopholes Lay and others jumped through escaped legal responsibility. After leaving the government, Wendy Gramm joined Enron’s board, where she headed the audit committee that managed to avoid auditing the company’s disgraceful accounting procedures–just as her husband has apparently looked the other way during his stint in the private sector with UBS. Sure, Phil Gramm lost his position as the co-chairman of John McCain’s presidential campaign when he blamed the recession not on the banking deregulation he championed but rather the people of the United States, which he described as a “nation of whiners.” But that was a sideshow compared with the serious charges now swirling around UBS, charges that may finally prove to be Gramm’s undoing.